A prosperous city in the time of Alexander the Great, Perge is thought to have been in existence since the 4th century BC, and is home to the most extensive display of ruins of any of the Pamphlyian cities. Walk down cobbled streets grooved by the wheels of chariots and horse-drawn carts and into a broad, colonnaded street leading to a giant theatre and stadium, an impressive complex of ancient baths, enormous Hellenistic and Roman gates, an agora, an acropolis, and a necropolis scattered with ancient tombs. 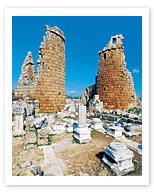 A walk through Perge will no doubt bring visions of a glorious and tempestuous past to life.